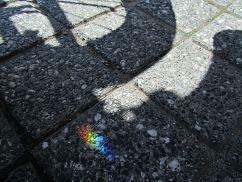 A small rainbow created by the bicycle basket. This morning, when I picked Youka up to put her in the bicycle basket, I found a small rainbow that was created by the bicycle basket’s plastic working as a prism. It was a really tiny one but a good find that made me feel happy.